Wednesday August 5th 1896 I did the washing alone. The boys were stacking oats and Charlie started with the apple waggon. I put in nearly all the afternoon scrubbing and cleaning around. It was late when we got through dinner. 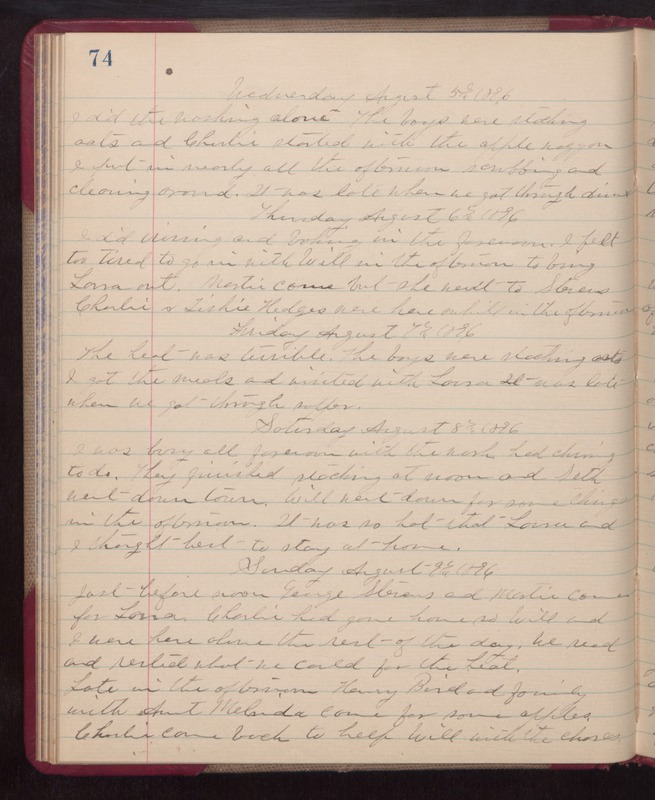 Thursday August 6th 1896 I did ironing and baking in the forenoon. I felt too tired to go in with Will in the afternoon to bring Laura out. Martie come but she went to Stevens. Charlie & Tishie Hedges were here awhile in the afternoon. Friday August 7th 1896 The heat was terrible. The boys were stacking oats. I got the meals and visited with Laura. It was late when we got through supper. Saturday August 8th 1896 I was busy all forenoon with the work. Had churning to do. They finished stacking at noon and Seth went down town. Will went down for some things in the afternoon. It was so hot that Laura and I thought best to stay at home. Sunday August 9th 1896 Just before noon George Stevens and Martie came for Laura. Charlie had gone home so Will and I were here alone the rest of the day. We read and rested what we could for the heat. Late in the afternoon Henry Bird and family with Aunt Melinda came for some apples. Charlie came back to help Will with the chores.